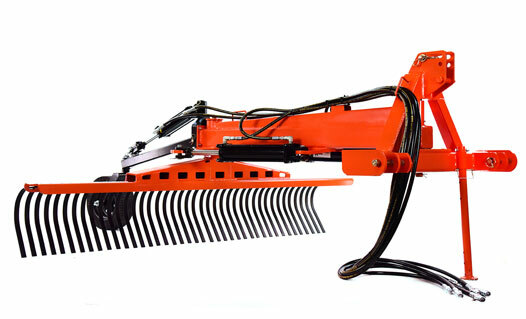 First of all a landscape rake is a tractor attachment that is looks like a large rake or comb. Crafted out of steel and sometime hydraulics. So what are landscape rakes used for well landscape rakes are used for a number of different things but mainly used for clearing debris, leveling landscape, removing roots and rocks. While they cost more hydraulics can be added to tractor landscape rakes in order to make things easier for the operator. Hydraulics are used to angle the rake in different positions for the desired outcome. It's even possible to add hydraulics to the real gauge wheel to adjust the height of the rake. If cost is a factor tilting of the rake can be accomplished manually however this can require a lot of trial and error and getting on and off the tractor while getting the exact angle you are looking for. Hydraulics can save a lot of time and hassle and over all save you money in the long run depending on how much angling you would need. Landscape Rakes are made up of a number of tines each placed in individual, laser cut holes and held in place by bolts for easy replacement. The tines are made of industrial standard steel and give a spring lik action the helps prevents the tines from digging into the ground. Landscape Rakes are compatible with a Category 1 & 2 Quick Hitch. Optional hydraulic Angle, Offset, and even hydraulic tailwheel. You can find a lot of different vendors online but one of the best selections that has a number of different sizes and styles to choose from is Everything Attachments. Below are two of their more popular landscape rakes however check out their online store to find more Tractor Landscape Rakes. One of the largest Landscape Rakes on the Market this rake is massive and super heavy duty. 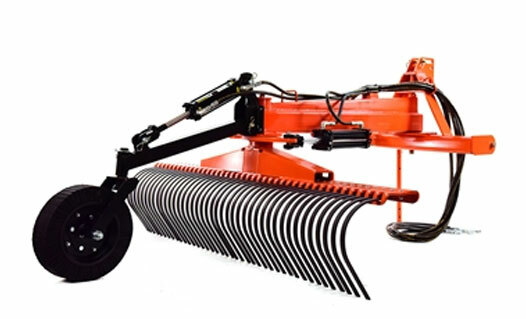 Designed for large tractors this rake can be equipped with hydraulics for the offset, position angle, and for a gauge wheel. Ranging in sizes from 72 inches wide to 96 inches wide and weighting as much as 745 lbs for the 96" model. 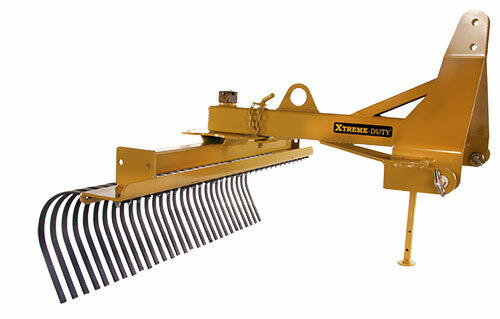 The EA Severe XTreme Duty Tractor Landscape Rake is built more for compact and subcompact tractors. Like the Land Shark version this rake has an optional gauge wheel, and quick hitch compatible. There are 8 forward and reverse angle settings and Category I and II hitch. Due to a floating style hitch this rake offers better performance with the use of gauge wheels. In this video Ted from Everything Attachments goes over the features and explains in detail about the new and massive landscape rake.